Every child loves stuffed animals and therefore build a bear has become very popular. This would be a wonderful idea for a birthday party theme. You could choose the easy way and cart the birthday party group to the mall having everyone make their own bear and buy outfits for each guest, or you could get a little more creative, have the party at your own house and end up with a little extra cash in your wallet. Build a bear party supplies are very accessible to find online or in party stores in most towns. 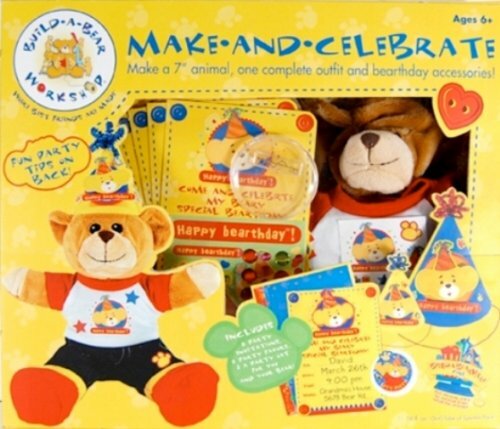 One website found had a complete set of build a bear birthday party supplies including everything from invitations, balloons, paper products, confetti, piñatas, thank you notes and banners. There are nonstick 3D build a bear cake pans from Nordic Ware that can be found at Williams and Sonoma that are simple to use by making the cake in two separate sections then joining them together, or just make cupcakes and use bear candles with confetti sprinkled on the top. Party favors with this theme can be found online and in stores also, including favor bags or boxes, stickers, notepads, coloring books and crayons, bracelets, personalized bear t-shirts, printed CD-R’s that you can copy pictures from the party and send home with each child. An easy party activity would be to purchase a build a bear kit, which is sold at several craft stores, for each child and have them make their bear at the party. Or to save some money, it could be requested that each child bring their own favorite bear or stuff animal of a specific size to the party and a personalized t-shirt could be designed using fabric markers. These shirts can be found at craft stores in the doll supply areas or even many dollar stores. You could create a “bear bingo” game with the squares being teddy bear terms, such as paws, fur, hibernate, and growl instead of the usual A-5 and G-19. By making the bingo cards into only 16 squares instead of the usual 25 squares, it would allow for quicker and more games in the same amount of time. Another game could be a treasure hunt where you hide mini-bears all around the room for the children to find and give out prizes to the each child as they find the bears, just make sure each child gets a prize. Whatever the games or activities, anything that would involve a child’s favorite stuffed bear will be a hit and remembered as a great time.